Elk's Run Los Angeles Release Party, originally uploaded by Joshua Hale Fialkov. Just wanted to drop y'all an early word about the impending release of Elk's Run, and the party to celebrate! 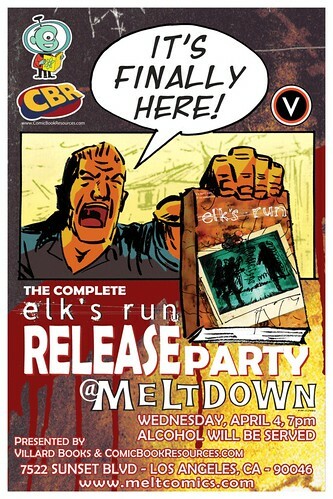 With the aid of the good folks over at CBR.com and our devoted publisher Villard, the good folks at Meltdown Comics in Hollywood, are helping us celebrate in style. There'll be food, alcohol, music, and best of all, the COMPLETE ELK'S RUN! I hope all of you can attend, and ask you to please forward this around and help us get the word out about the party. We're going to send out a Press Release about the party soon, but, I figured the extra warning would be worth it. Keep an eye on www.meltcomics.com for more info as it becomes available.See you in a few weeks!